Department of Pharmaceutics, Prin. K. M. Kundnani College of Pharmacy, Cuffe Parde, Colaba, Mumbai - 400005, Maharashtra, India. ABSTRACT: Tuberculosis (TB) is an alluring affliction caused predominantly by Mycobacterium tuberculosis bacteria. A stumbling block in the conventional treatment of TB is the occurrence of multiple drug resistance (MDR) followed by high dose requirement, subsequent intolerance & severe toxicity. Nanoparticulate-based drug therapy has significant potency in the treatment of TB. In this present study, Linezolid loaded Eudragit RS 100 polymeric nanoparticles (LZD-PNPs) were developed and characterised for the treatment of TB. Double emulsion solvent evaporation method was selected to incorporate LZD into Eudragit RS 100. Differential scanning calorimetry (DSC), Fourier Transfer Infrared spectroscopy (FT-IR) studies were done to assess drug-polymer compatibility and to indicate absence of incompatibility. Particle size analysis was carried out to measure the mean particle size of the LZD-PNPs and was found to be at 47nm-119nm (±26 to 41 SD) which indicated the polydispersity of the formulation. Zeta potential analysis of the sample was found to be -32 to -41mv, indicating its physicochemical stability. The Entrapment efficiency of LZD-PNPs ranged between 75.56% to 80.42%. Optimization of the LZD-PNPs was done by response surface analysis (Design Expert 11.0.5.0 software State Ease, Inc., Minneapolis, MN). 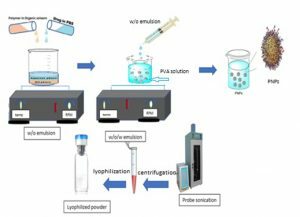 The above data suggest that linezolid loaded Eudragit RS 100 polymeric nanoparticle were successfully formulated by double emulsion solvent evaporation method and characterized for effective delivery of MDR-TB. INTRODUCTION: Tuberculosis (TB) is an infectious disease caused mainly by Mycobacterium tuberculosis. India accounts for one-fourth of the global TB burden. Annually 2.2 million new cases are added to the existing cases. It is estimated that there are 2.5 million prevalent cases of all forms of TB disease. It is also estimated that annually about 2.2 lakh people die due to TB 1. Presence of immunosuppressive conditions like diabetes, alcoholism, malnutrition, chronic lung disease and HIV/AIDS may increase the chances of TB infection. The disease typically attacks the lungs but can also develop as extra pulmonary TB in the central nervous system or circulatory system or elsewhere in the body. Untreated active TB has about 50% mortality rate 2. Even though we live in an era of advanced technology & innovation, infectious disease like Tuberculosis (TB), continue to be one of the greatest challenges worldwide. The main drawbacks of conventional treatment are the development of multiple drug resistance, resulting in high dose requirements & subsequent intolerance & toxicity 3. Therefore, there is need of a new system with the aim of minimizing the side effects of drug therapy 2. The era of nanotechnology have considerable potential in the field of drug delivery 4. Polymeric nanoparticle-based drug delivery systems form the crux of nano medicine. They are suitable for targeting chronic diseases such as tuberculosis as they cross the biological barriers and target cellular reservoirs of Mycobacterium tuberculosis. For first line as well as second line antitubercular drugs, employing synthetic or natural carriers, a mainly polymer is the key for intermittent chemotherapy. Other potential advantages of this system include the possibility of selecting various routes of chemotherapy, increasing bioavailability, reducing drug dosage and dosing frequency resulting in reduced adverse effects, and better targeting of both drug-resistant and latent bacteria 2. Polymeric nanoparticles employing PLGA shown promise as far as intermittent chemotherapy in experimental tuberculosis is concerned 5. The main goal in formulating nanoparticles as a delivery system is to reduced particle size, do modification in surface properties and hence improve release of the pharmacologically active agents to reach site of action at therapeutically optimal rate 2. Desired particle size required for drug localization upon administration by inhalation is between 50 to 200 nm 6. Prior to adequate clinical data to support the use of novel drugs in the treatment of MDR-TB linezolid has been gently used as a repurposed agent in the treatment of fluoroquinolone-resistant MDR-TB with accomplishment. Trial of linezolid is in the final planning stage 7. In present work LZD was used as a model drug, this then was encapsulated into copolymer of ethyl acrylate and polyvinyl alcohol to form polymeric nanoparticles and formulated batches were characterised. Material: Commercial grade Linezolid from Symed Labs Limited; (Hyderabad) and Eudragit RS 100 from Evonik (Roehm pharma Polymers), were gift samples. PVA was obtained from S.D. fine chemicals. Solvents used were dichloro-methane (Merck, India), Tween 80, Millipore water and all other chemicals were locally procured. All the excipients used were pharmaceutically approved complying with I.P/ B.P/USP or in house specification. Preparation of Polymeric Nanoparticles: LZD-loaded polymeric nanoparticles were prepared using double-emulsion solvent evaporation technique 8. To know the effect of polymer and stabilizer concentration, various formulations (F1-F9) were prepared as shown in Table 1. Primarily, polymeric solution were prepared by dissolving Eudragit RS 100 in 20 ml dichloromethane. Followed by emulsification with 0.1% w/v aqueous drug solution consisting of 2% (v/v) tween 80. The above solution was kept under magnetic stirring (Remi Magnetic Stirrer) at 1200 rpm for 30 min to get primary W/O stable emulsion. Further this was added to 0.5% (w/v) polyvinyl alcohol (PVA) solution under stirring at 900 rpm for 25 min, to achieve a w/o/w double emulsion. The obtained polymeric nanoparticles were separated by centrifugation (Remi cold centrifuge) at 11,000 rpm for 45 min and collected. Finally, the products were freeze dried by using lyophilizer (Labocon), 1.5% (w/v) trehalose was added as a cryoprotectant and product was stored at RT 9. Schematic representation of polymeric nano-particle preparation is as shown in Fig. 1. Optimization by Experimental Design: Design Expert software version 11.0.5.0 (State Ease, Inc., Minneapolis, MN) was used to optimize the batches F1-F9 as shown in Table 1. Data of all batches was uploaded in the software and then analysed subjecting to ANOVA. The advantage of this software is the reduction in the number of experiments required for formulating the batches thus saving time, energy and aids in checking only the minimum number of batches by which the relationship between various factors on their responses can be determined. The multiple linear regressions using ANOVA was carried out for deciding the significance and influence of each individual factor as well as their interactions on response variables. 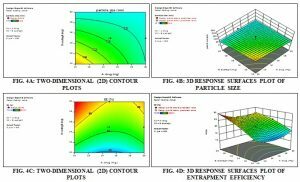 A checkpoint analysis was performed to confirm the role of the derived polynomial equation and contour plots in predicting the responses. Optimization was performed by using desirability approach 11. 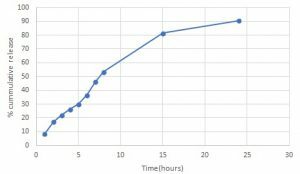 Fourier - Transform Infrared (FTIR) Spectroscopy: Drug excipient compatibility studies were carried out using Bruker Fourier Transform Infra-red Spectroscopy of drug and along with excipients 12. FTIR transmission spectra was recorded by scanning KBr pellets at 4 mm/s at a resolution of 2 cm over a wavenumber range of 400-4000 cm -1. The Fourier - Transform Infrared (FTIR) spectroscopy study was performed to confirm the cross-linking reaction, to evaluate interaction, if any, between drug and excipients and to ensure the LZD encapsulation into the PNPs. The peaks in the FT-IR graphs were compared and change in transmittance in the graphs was observed 11. Differential Scanning Calorimetry: The DSC analysis of LZD, and the Physical mixture was carried out using the Mettler DSC 60 computerized with Mettler Toledo Star software system (Mettler, Switzerland). Primarily calibration of instrument was done with indium standard. Accurately weighed samples were placed in aluminium sample pans. Thermograms were obtained by heating the sample at a constant rate of 10 ºC/min. A dry purge of nitrogen gas at 20 ml/min was used for all runs. Samples were heated from 30 - 300 ºC. Scans were obtained from the samples. The melting point and peak maxima were observed in the DSC graphs 13. Determination of the Particle Size: The LZD-PNPs were analysed for their size distribution and their potential using Nanoparticle Tracking Analysis (NTA) Nano sight NS500 version 3.1 (Malvern Instruments Ltd., Worcestershire, UK) 14. Particle size results were calculated from the determined translational diffusion coefficients using a modified version of the Stokes-Einstein formula, Eq. (3). Where (x, y)2 is the mean-square displacement in two dimensions, Dx,y is the translational diffusion coefficient in two dimensions, kB is Boltzmann’s constant, T is the sample temperature, t is the time, η is the viscosity of the dispersion medium and d is the sphere-equivalent hydrodynamic diameter 15. Particle tracking analysis (PTA), often referred to as nanoparticle tracking analysis. (NTA), generally consists of sample preparation, video recording and video analysis, equipped with a sample chamber with a 640-nm laser and a Viton Fluor elastomer O-ring. Sample preparation often requires diluting the supplied sample in an aqueous medium such as purified water until the particle concentration is within the recommended range of 107 to 109 particles/mL 16. The samples were injected in the sample chamber with normal syringe until the liquid reached the tip of the nozzle 15. This study was done with the specification of nano sight NS500 with the computer-controlled motorized stage with CCD camera and red (640 nm) laser and automated sample introduction 13. Surface Charge Determination: Polymeric Nanoparticles were characterized with Nanoparticle Tracking Analysis (NTA) using Nanosight NS500 version 3.1 (Malvern Instruments Ltd., Worcestershire, UK). The zeta potential measurements were performed by using an automatic mode. The prepared nanoparticulate samples were diluted with Millipore water and kept in the measurement cell for potential energy analysis, and then analysed after the suitable position adjusted 17. Applied voltage was set at 24v, and dielectric constant at 80. Sample loading was done automatically after prime fluidics. Video frame obtained was of zeta analysis. Entrapment Efficiency: Determination of % drug-entrapment efficiency, & % drug loading of LZD-PNPs was determined by indirect method & direct method respectively. The nanoparticulate dispersion was centrifuged at 15000 rpm for 45 min at 4 °C using refrigerated cold centrifuge(Eltek RC 4100 D, India). The free drug content in supernatant was measured by Ultraviolet-Visible spectroscopy (Thermo Scientific, Evolution 300, India) at 251 nm against blank sample to avoid any possible excipient interference. The % EE was determined in triplicate. The % EE of PNPs was calculated by the following equation 11. % Drug entrapment efficiency = [(Drug added - Free "unentrapped drug") / Drug added] × 100. Drug Loading: The % drug loading was measured by direct method. 5 mg of freeze-dried formulation was taken in 5 ml of PBS and sonicated for 30 min. The nanoparticulate dispersion was stored for 48 hr. The resultant mixture was centrifuged at 15000 rpm for 45 min at 4 °C. The free drug content in supernatant was measured by Ultraviolet-Visible spectroscopy at 251 nm against PBS to avoid any possible excipient interference. The % drug loading and % yield was calculated by following formula in triplicate 11. SEM Analysis: Particle size distribution and Surface morphology of the prepared PNPs were checked by Field Emission GUN Scanning electron microscopy (SEM), it determines the particle size distribution and surface morphology 18. Approximately 5 μL of the PNPs formulation was taken on to a cover slip, which in turn was mounted on a specimen tab. The samples were dried at room temperature. Then the particle size of the formulation was viewed and photographed using Scanning Electron Microscope (Sigma, Carl Zeiss) 19. Photomicrographs were observed at 1 to 100KX magnification operated with an acceleration voltage of 5 kV and working distance of 9.8 mm was maintained 9. The particles were coated with platinum by using vacuum evaporator and thus, the coated samples were viewed and photographed in JEOL JSM-6701F Field Emission SEM 20. In-vitro Drug Release Studies: Dialysis bag diffusion technique was used to determine the in-vitro drug release of LZD loaded polymeric nanoparticles. The prepared freeze-dried powder nanoparticles were put in the dialysis bag and deep into 50 ml of Phosphate Buffer saline (pH7.4). The entire system was maintained at 37 ± 0.5 ºC. With the continuous magnetic stirring at 200 rpm, aliquots were withdrawn from the medium at predetermined intervals and replaced by fresh medium. The amount of drug dissolved was deter-mined with UV-Vis Spectrophotometry (Thermo Scientific, Evolution 300, India) at 251 nm & % cumulative release was calculated against time 17. Preparation of Linezolid Loaded Eudragit RS 100 Polymeric Nanoparticle: Linezolid loaded Eudragit RS 100 Nanoparticles were successfully prepared by Double emulsion solvent evaporation method. PVA a copolymer was also act as stabilizer. The prepared particles were stored in lyophilized form for their stability 17. The selection of a specific method of encapsulation is usually determined by the solubility characteristics of the drug. In this approach, the double emulsion-evaporation process was adopted since it is known to be superior to other incorporation methods in terms of encapsulation of both hydrophilic and hydrophobic molecule i.e. encapsulation by this method involves two major steps, the formation of stable droplets of the first emulsion and the subsequent removal of solvent from the droplets of the second emulsion. The LZD encapsulation efficiency and the particle size have been optimized by varying the amount of polymer and stabilizer 21. Differential Scanning Calorimetry: DSC thermograms of Linezolid, and physical admixtures of Linezolid with other excipients were recorded as shown in Fig. 2a and b respectively. The thermal behaviour of pure drug Linezolid shows peak endotherm at 181.2 °C corresponding to loss of water of crystallization and melting of pure drug 22. The peak showed that there were no significant compatibility problems between the drug and the polymer 17. FTIR Studies: From the FTIR spectroscopy, it was concluded that the Linezolid is crystalline in nature 22. FT-IR results are shown in Fig. 3a and 3b. The IR spectrum of LZD indicates the appearance of three main bands at 3360, 1741 and 1672 cm-1 corresponding to NH amide, C=O lactone and C=O amide, respectively 23. Other IR absorption peaks of Linezolid were at 2977 cm-1 (=N-H stretch), 1356.1 cm-1 (C-N stretch), 1047.73 cm-1 (C-F stretch), and 2851.11 cm-1 (-OCH3) 24. Fig. 3b represent IR spectrum of physical mixture, and it shows bands at 3331.13 cm -1, 2915.82 cm-1 and 2848.81 cm-1 23. Particle Size and Zeta Potential Analysis: The average particle size of all batches lie within the range of 47 nm-119 (±26 to 41 SD). Both polymer and stabilizer play a vital role in particle size distribution in Polymeric nano formulations. From Table 4, it is seen that batch F5 was found to have the optimum particle size with least standard deviation. Particle size goes on increasing with an increase in concentration of polymer and stabilizer. 1:2 drug/polymer ratio showed best results. Zeta potential indicates the stability of the batches. Greater the zeta potential greater is the stability. From the table given below it is observed that highest zeta potential is of batch F5, due to optimum concentration levels of polymer and stabilizer. An increase in the concentration of polymer in the organic phase leading to an increase of both the size and the polydispersity of the PNPs. In addition, with increasing amount of polymer in the organic phase, an increase in particle size distribution of PNPs were observed. Both the polymer and stabilising agent exhibited significant effect on the particle size. Single peak obtained in particle size analysis graph indicates the Poly-dispersity index (PDI) of LZD-PNPs. Generally, the value of PDI ranges from zero to one 2, 25, 26. Response Surface Analysis: The entrapment (Y1) and mean particles size (Y2) of LZD loaded PNPs showed R2 values at 0.7813 and 0.9865, respectively as shown in Table 5a, indicating good fit and it was concluded that the second order model adequately gives the values for true surface. From Table 5b it concluded that P-values less than 0.0500 indicate model terms are significant and the model F-value of 4.55 implies the model is significant. 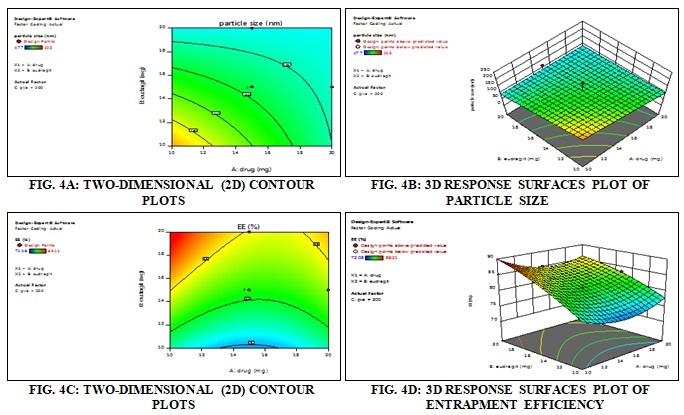 Design expert software was used to produce three-dimensional (3D) response surfaces and two-dimensional (2D) contour plots. The 3D surfaces and 2D contour plots are graphical representations of the regression equation for the optimization of LZD loaded Eudragit RS 100 coated PNPS and are the most useful approach in revealing the effects of the factors on the responses. The results of the interactions between two independent variables and two dependent variables are shown in Fig. 4a, b, and c, d. As it can be seen in Fig. 4b and d, there is an increase in the polymer concentration with an increase of particle size distribution and % entrapment efficiency. With the optimum polymer concentration particle size distribution increases as it goes beyond the optimum range for particle size and the % entrapment efficiency decreases 27. Entrapment Efficiency (EE %): Entrapment efficiency gives the amount of drug entrapped in the nanoparticles. Entrapment efficiency (EE %) of the prepared LZD PNPs formulations is influenced by polymer concentration and stabilizer agent. 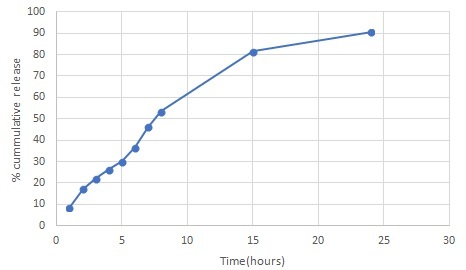 According to the obtained result, the entrapment efficiency of F5 formulation is high i.e. 80.42 % as compare to other batches as shown in Table 4 26. This may be due to an increase in polymer concentration leading to an increase of the viscosity of the first emulsion and consequently to a reduction in the partitioning of the Drug into the external aqueous phase, resulting in an increase in drug entrapment efficiency 21. 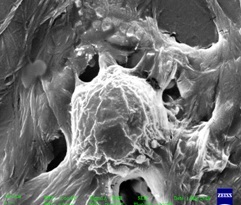 Morphological Studies: The surface morphology of the optimized batch was done using FEG-SEM and was found to be uniform with spherical shape and smooth texture 25. Fig. 5 shows that FEG-SEM Linezolid loaded PNPs was effectively coated with Eudragit RS 100 polymer. In-vitro Drug Release Studies: The optimized LZD-Eudragit RS 100 PNPs were subjected to in-vitro drug release profile. PBS pH7.4 was used as medium for evaluating the pattern of release of linezolid from Eudragit RS100 nanoparticles as in Fig. 6. LZD-PNPs showed less initial burst release which may be due to its structural integrity and packed coat. The slow drug release from LZD loaded Eudragit RS100 showed that the matrix formed by polymer helped in sustained release of drug at 90.45% up to 24 h. The release profiles of the pure drug showed an immediate release of the entire drug. Therefore, the study suggested that the prepared LZD loaded PNPs can be used in sustained release drug delivery 21, 28. CONCLUSION: As one of the important advantages of polymeric nanoparticle; encapsulation of hydrophilic linezolid into Eudragit RS 100 was achieved successfully. Double emulsion solvent evaporation was opulently used for the preparation of LZD-PNPs. Thus LZD-PNPs from the above investigation concluded that the preparation of drug loaded nanoparticles by emulsion solvent evaporation method is governed by different preparation variables. In this technique the most important factor for reducing the size of the nanoparticles is to increase the shear stress during emulsification, which is done by increasing the applied energy, decreasing the polymer content in organic solvent, using sufficient amount of surfactant, and stabilizer or co-polymer. Based on the optimization of these variables we have successfully synthesized spherical, smooth textured nanoparticles of linezolid which were reproducible. ACKNOWLEDGEMENT: The authors are thankful to Symed Labs Limited; Hyderabad, India, for the gift sample of Linezolid, and to FIST-DST for providing FTIR facility. CONFLICT OF INTEREST: The authors report no conflicts of interest. Ministry of Health & Family Welfare Government of India. Revised National TB Control Programme Techincal and Operational Guidelines for Tuberculosis Control in India 2016. Varma JN, Kumar TS, Prasanthi B and Ratna JV: Formulation and characterization of pyrazinamide polymeric nanoparticles for pulmonary tuberculosis: efficiency for alveolar macrophage targeting. Indian J Pharm Sci 2015; 77(3): 258-266. Pandey R and Khuller GK: Nanotechnology Based Drug Delivery System(s) for the Management of Tuberculosis. Indian J Exp Biol 2006; 44(5): 357–366. Nagavarma BVN, Yadav HKS, Ayaz A, Vasudha LS and Shivakumar HG: Different techniques for preparation of polymeric nanoparticles- a review. Asian J Pharm Clin Res 2012; 5(S3): 16-23. Ahmed AB and Kantanath L: Drug-excipients compatibility studies of nicorandil in controlled release floating tablet. 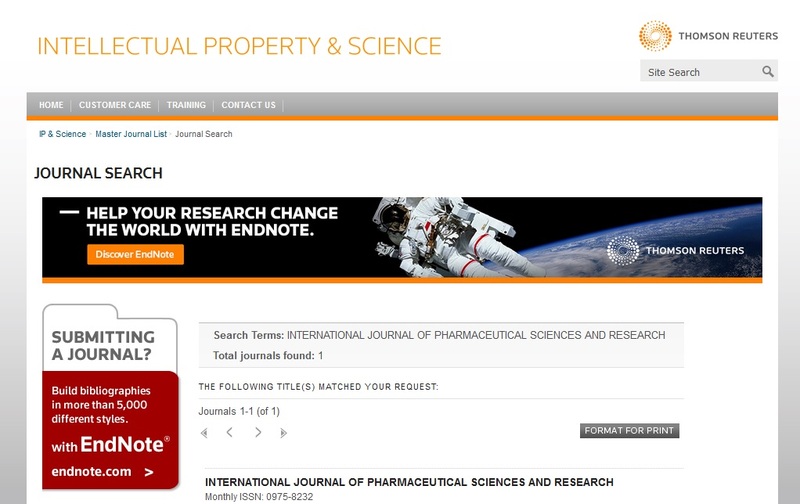 Int J Pharm Pharm Sci 2014; 6(S2): 468-475. Shaji J and Bajaj R: Formulation development of 5-fluorouracil transethosomes for skin cancer therapy. IJPPR. Human 2017; 11(1): 453-464. Filipe V, Hawe A and Jiskoot W: Critical evaluation of nanoparticle tracking analysis (NTA) by nanosight for the measurement of nanoparticles and protein aggregates. Pharm Res 2010; 27(5): 796-810. doi: 10.1007/s11095-010-0073-2. Sakthivel D and Arunachalam G: Preparation and characterization of polymeric nanoparticles used in the treatment of epilepsy 2017; 9(3): 298-301. Crucho CIC and Barros MT: Formulation of functionalized PLGA polymeric nanoparticles for targeted drug delivery. Polymer 2015. doi: 10.1016/j.polymer. 2015.04.083. Dhase AS and Saboo SS: Preparation and evaluation of phytosomes containing methanolic extract of leaves of Aegle marmelos (Bael). Int J PharmTech Res 2015; 8(6): 231-240. Lamprecht A, Ubrich N, Hombreiro Pérez M, Lehr CM, Hoffman M and Maincent P: Biodegradable Mono-dispersed nanoparticles prepared by pressure homogenization-emulsification. Int J Pharm 1999, 184(1): 97-105. Chauhan VV and Puranik SB: Formulation and evaluation of taste masked tablets of linezolid. IJPPR. Human 2015; 2(3): 130-145. Gowda DV, Datta V, SM HS and Gupta VK: Formulation and evaluation of dry powders anti. Indo American Journal of Pharm Research 2013; 3(12): 1239-1248. Dora CP, Singh SK, Kumar S, Datusalia AK and Deep A: Development and characterization of nanoparticles of glibenclamide by solvent displacement method. Acta Pol Pharm Drug Res 2010; 67(3): 283-290. Bohrey S, Chourasiya V and Pandey A: Polymeric nanoparticles containing diazepam: preparation, optimi-zation, characterization, in-vitro drug release and release kinetic study. Nano Converg 2016; 3(1): 3. Shaji J and Kumbhar M: Formulation and characterization of Linezolid loaded eudragit RS 100 polymeric nanoparticles. Int J Pharm Sci & Res 2019; 10(4): 1944-52. doi: 10.13040/IJPSR.0975-8232.10(4).1944-52. 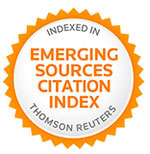 Authors Address: Department of Pharmaceutics, Prin. K. M. Kundnani College of Pharmacy, Cuffe Parde, Colaba, Mumbai, Maharashtra, India.